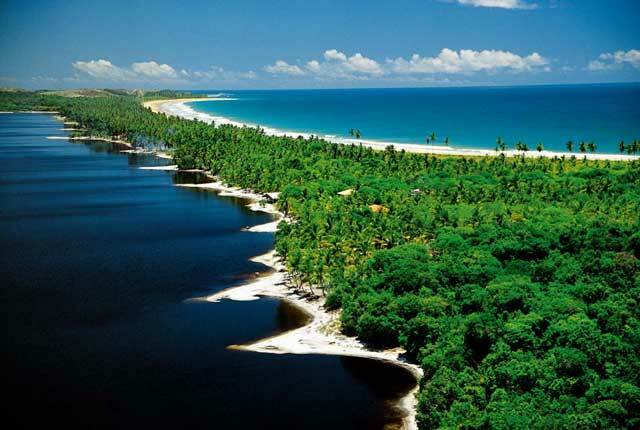 Barra Grande is the best known village in the region of the Marau Península, on the Dendê Coast, southern Bahia. This prime location is located between Ilhéus and Salvador. It has about 40km of coast line. Barra Grande is one of the newest unique destinations in Brazil. The Peninsula is full of heavenly beaches, being many among the top list of Brazilian surfers. Saquaira beach, Algodões and Cassange, are also considered the most exclusive beaches in that region. The many islands and the well preserved nature are an invitation for wonderful hikes to enjoy the lush visual, wildlife and the local flora. The view is stunning, with huge palm trees, deserted beaches, rivers, ponds, natural pools with clear water, mangroves, rainforest and a lot of wildlife. To get to know everything closely, you can rent a car or a boat and visit the many beaches of the peninsula. Small and rustic, the village consists of typical houses of the region and the streets are unpaved. There are bars and restaurants with Brazilian food options. Check the houses available for renting in Barra Grande and Península de Maraú. Check the houses available for selling in Barra Grande and Península de Maraú.